You are currently browsing the category archive for the ‘idea’ category. A plan is in the works to bring a Disc Golf Course to Foreman Grove, on Jacksonville’s east side. Illinois College students Nathan Zimmerman and Caleb Harris made a presentation recently to the city’s Parks & Lakes Committee. 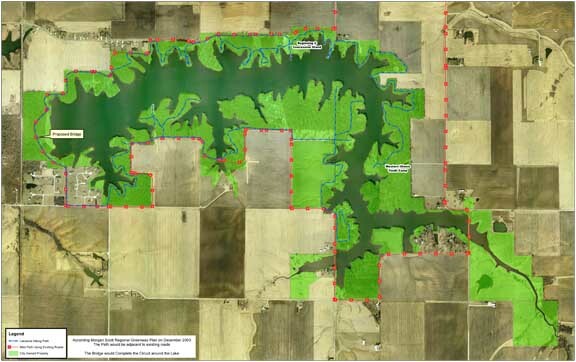 They, along with MacMurray College students Janson Shehorn and Cydny Saxer and others, have been working with the Parks & Lakes Department on plans for a course in the little-used park. The group so far has approached businesses to sponsor the nine holes on the course (Jacksonville businesses have precedence on hole sponsorships). That and other funds raised, along with interest on the city’s Goveia Family Trust the Parks & Lakes Committee recommended be used to support the project, could allow for completion of the course this spring. The course will be walking distance from Mac and is on the planned route of the Town Brook recreational path. Disc golf is popular amongst high school and college students, and will be a great recreational resource along Jacksonville’s waterways. 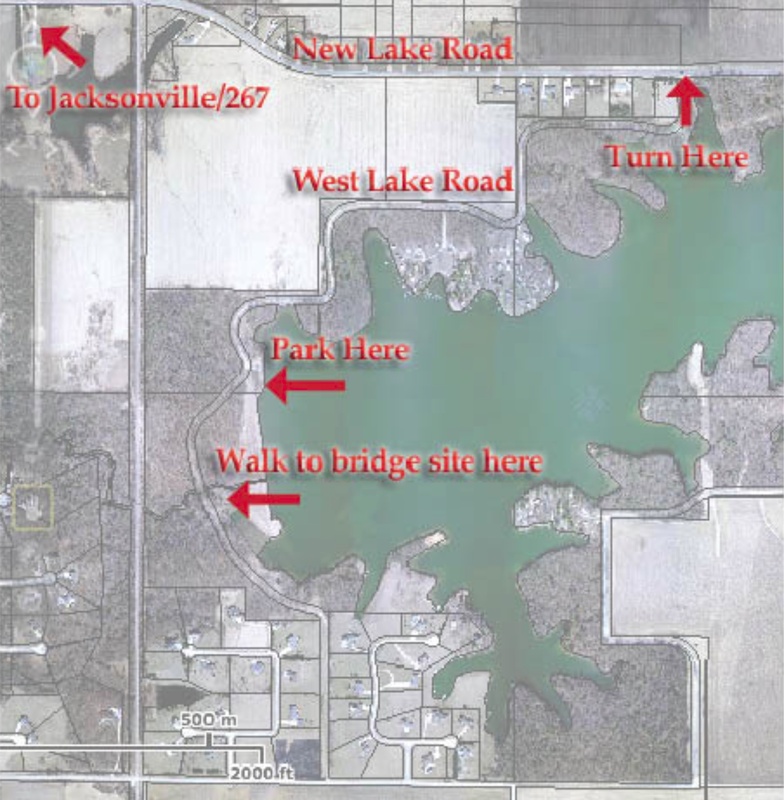 City approval for the disc golf course is expected Monday Feb. 24th during the Jacksonville city council meeting. A Parks & Lakes Committee meeting is at 6pm (probably focused on the senior center); discussion during workshop session at 6:30pm; and hopefully a vote during the city council meeting starting at 7:30pm. Come out to the meeting to show your support, check the Town Brook Twitter feed for updates. Last week on the TownBrook.com Facebook page we posted updates on the work of Passavant Area Hospital, the Morgan County Health Department and the Childhood Wellness Coalition to make Jacksonville, Illinois a more health community. One of the priorities is battling metabolic syndrome. Wendy Smith had an article in The Source Newspaper with details . . .
You’ve heard about heart disease, stroke, and diabetes, but did you know there is a syndrome made up of a cluster of risk factors that increases your risk for all three? Metabolic Syndrome is a group of metabolic risk factors that, occurring together, increase the risk of these deadly conditions. Many people have just one of these conditions, but that does not mean they have metabolic syndrome, although all of the conditions are independent markers of an increased risk for serious disease. More than one of these conditions in combination increase that risk. The poor American diet and sedentary lifestyle has created a population that is plagued by signs of metabolic syndrome. While many people have been diagnosed, there are many more that have the condition and do not know it. Even more have never even heard of metabolic syndrome. The Morgan County Health Department and Passavant Area Hospital have both identified metabolic syndrome as a priority health need. Morgan County showed higher rates than Illinois averages of smokers, obesity, physical inactivity, and low consumption of fruits and vegetables. Get regular check-ups! Having blood work and seeing your family physician often are the best way to prevent disease and diagnose things early. He or she will monitor your blood pressure, cholesterol, weight, cholesterol, glucose, and triglycerides. Also, consult your doctor before trying a new diet or exercise plan. Maintain a healthy weight. Having a BMI greater than 25 increases your risk of developing metabolic syndrome. Get moving! You don’t have to join a gym, although that can be great motivation. A brisk 30-45 minute walk each day will do the trick. This will not only keep your weight and blood pressure down, but may help your mood as well. Eat a healthy diet. You know the good stuff: fruits, veggies, lean meat, whole grains. Watch your fat and cholesterol and salt by avoiding fried and processed foods and added salt. Summer is the best time to get started, think grilled fish and chicken, farm fresh fruits and vegetables, and plenty of cold water. Thanks to Wendy and The Source for letting us reprint their article. For more information check our Facebook page for . . . The Helen A. Dean Community Garden, at 32 Book Lane, Jacksonville Illinois 62650. Project of Illinois College, Starhill Forest Arboretum and the Passavant Area Hospital Community Childhood Wellness Coalition. Illinois College has partnered with Passavant Area Hospital’s Community Childhood Wellness Coalition, and the internationally-known Starhill Forest Arboretum to create a community garden in the city of Jacksonville. The Helen A. Dean Community Garden, located at 32 Book Lane., provides an opportunity for Illinois College students to integrate their learning, leadership and service with the goal of the health and wellness of the greater Jacksonville community, especially school children and their families. Located in a residential neighborhood, the Garden is a living and learning laboratory. Passavant Area Hospital & Morgan County Health Department Community Health Needs Assessment. Need to exercise for metabolic syndrome. (or complete document). Did you know that Illinois ranks tenth highest in the nation for Childhood Obesity? (local report) According to a report released last summer by the Trust for America’s Health and the Robert Wood Johnson Foundation, 20.4 percent of our state’s children ages 10-17 are overweight or obese. Upon learning this alarming fact, Passavant Area Hospital initiated a Community Childhood Wellness Coalition. The goal of this group is to create a partnership of community leaders from government agencies, schools, churches, day care providers, healthcare providers, and other local businesses to work together and create awareness, education, and programs devoted to physical fitness, nutrition and weight management for children and their parents. A park and a path along the Town Brook and connecting Jacksonville’s waterways and parks would be an encouragement for youth and for all to be more physically active and lead to a healthier community. The Source newspaper ran a profile on Kate Roth, including her involvement in Girls on the Run and her work to bring the program to Jacksonville, Illinois 62650. “Girls on the Run seeks to inspire girls to be joyful, healthy and confident using a fun, experience-based curriculum which creatively integrates running.” Town Brook would love groups like this to use a Town Brook recreational path to get children into running and a lifetime of healthy living. Kate Roth remembers the first time her kids recognized their mother’s voice announcing the Jacksonville Downtown Celebration in a radio ad. She was sitting in Applebees, perusing the menu, when they drew her attention to the radio. The kids loved hearing their mother’s distinctive Australian accent on local radio, and she smiled, recalling how it all started. In the fall of 2009, two friends independently asked Kate to lend her voice to their business voicemail messages. Not long after, Kate discovered an “Introduction to Voice Over ” course while looking through the Lincoln Land Community College catalog. She always enjoyed seeking new learning opportunities and probably would not have noticed this class, except for her recent experience recording for friends. Kate decided to attend the evening class in Springfield and was intrigued by the recording process. An intensive weekend course followed in Chicago, including the opportunity to record a first demo. The demos were produced by a company independent from the course, giving students the opportunity to meet individuals from the recording industry. At the close of Kate’s recording session, the company representative “offered me a job before I even walked out the door, ” Kate recalls. “This really buoyed me, ” she says, and encouraged her to pursue her new interest. Kate opened her home recording studio in 2010. She records from a converted space in her home, allowing her to care for her three children and to work in the studio throughout the day. She subscribes to several professional sites that send audition opportunities her way. For Kate, each audition is a chance to practice her skills, so she doesn’t let her distinctive accent deter her. Some companies are seeking only American accents, but others appreciate her unique voice-over talents. The majority of Kate’s voice-overs are recorded in her home studio and are self-directed, but she occasionally travels for work. Kate traveled to Chicago most recently to record a tutorial for a cosmetology company. They are reaching out to the Australian market, so her voice proved a perfect fit. She recorded in two four-hour sessions to keep from losing her voice. While Kate enjoys recording individually, she also appreciates the opportunity to receive direction and work collaboratively. In addition to her recording work, Kate works as the Morgan County Coordinator for Girls on the Run. Kate heard about the program a few years ago from fellow running enthusiasts and loved the core beliefs behind it. She decided to work with other volunteers to spread Girls on the Run beyond Sangamon County and introduce it to Jacksonville. Girls on the Run encourages girls “to think outside the girl box,” Kate explains, and inspires them to be joyful, healthy, and confident. Through the program, girls in 3rd through 8th grades learn life skills through positive, dynamic lessons and running games. The girls have a goal during the year to participate in and complete a 5K. Kate appreciates how the program teaches life skills in a very positive way, preparing girls both emotionally and physically to set and complete their goals. The idea is to complete the 5K at the end, but Kate says, “They determine how to cross the finish line. They can walk, hop, skip, or jump.” She is excited by how quickly the program has grown over the past few years, and looking forward to seeing it expand to surrounding areas next fall. She is also able to use her professional skills as a nurse to volunteer as the school nurse at Our Savior’s School. She hasn’t practiced professionally full time since beginning her family but participates in continuing education to maintain her license. Volunteering in the school provides a fun opportunity to help her community and utilize her skills. Kate came to the United States 17 years ago from London as a traveling nurse. She laughs that she has “itchy feet ” and left Australia as a traveling nurse to experience different countries. Kate never intended to move away from Australia permanently but meeting her husband, John, changed those plans. The Roths will celebrate 15 years of marriage this October and enjoy traveling and experiencing the world together. Story, used with permission. Thanks to The Source and Mindy Farmer! And They’re Off . . . Moe, Larry, the cheese . . . The first Saturday in May. Name the big event. You likely answered The Kentucky Derby— the Run for the Roses—the Most Exciting Two Minutes in Sports. It is odd that such a renowned event lasts only two minutes. But really it’s not the event itself, is it? It’s the pomp, the show, the hats, the juleps, the parties and all that jazz that make the Derby an event. Otherwise, it would just be a race. A mile-and-a- quarter run to determine who has the fastest (on that day) three year-old thoroughbred. I understand that the pomp and pretense has even made its way to Duncan Park in Jacksonville. My, Oh, My (is that a horse’s name?) Well, dish me up some Hot Brown, finish it off with Derby Pie and call me to the gates. No, No. This is not an article about the Derby or Kentucky or horses, or bourbon. I’m into bicycling. And the BIG EVENT on the first Saturday in May is the annual Tour de Stooges. For seventeen years, this cycling event has taken place in Southern Illinois, first in Lebanon, now in Highland and has attracted as many as 650 riders in a single day, riders mostly from St. Louis and Southern Illinois, but also from as far away as Hawaii, Washington and Connecticut. In true “Tour” tradition, the routes available to riders vary in length and difficulty, but they all feature the beauty of the countryside of rural Illinois. Unlike The Tour, it is not a competitive ride—officially, that is. Personal bests are always pursued, and competitions, while not in the program, definitely occur on the road. No horses, no hats, no juleps. But there’s a party— in the event itself, whether one chooses to ride the Joe Besser “Not So Hard” Route – 17 miles, the Curly Howard Shuffle – 22 miles, the Larry Just Fine Route – 30 miles, the Shemp Howard Shortcut – 42 miles or the Moe Howard Metric – 64 miles. The party takes place on the road . . . and after at a catered lunch and “all the slapstick comedy you can stand”—up to 3 hours of Three Stooges films. The point to all this is what? Ride from 17 to 64 miles and have a ball! Riding is an excellent solitary sport, as well as a team sport at times. Cycling is a great fitness activity for all ages. Childhood obesity? Put them on bikes. Seniors who can no longer run and jump? Get on your bikes. But in addition to competition, sports and athletics, bicycling can be an excellent social activity, both during and after the ride. A whole lot of fun. So here is a Derby Day and Stooges Day call to action in two parts. First, there is a local citizens group, Town Brook Jacksonville, working to mobilize interest in and support for a new city park, a walk- bike-run trail along Mauvaisterre Creek with pedestrian/cycling connection to Downtown, to Community Park, to Nichols Park and to Lake Jacksonville AND to every merchant and point of interest along the way— and when we all learn to think big enough, even networking with similar trails in Springfield and Quincy and Alton and all the way to St. Louis. What an opportunity for both physical and social fitness! Find out about it and get on board. Thanks to Brittany Henry of the Jacksonville Area Convention & Visitors Bureau for passing on information from the state tourism newsletter about Trails for Illinois. Trails for Illinois‘ mission is to enhance the quality of life in Illinois by connecting the state’s communities and countryside with an interconnected, multi-use public trail network, and by promoting the use of trails for recreation and transportation (from their Facebook page Trails for Illinois). Their latest report (press release) shows recreational paths boost local economies. The proposed Town Brook recreational trail in Jacksonville, Illinois 62650, mountain biking trails created by Jacksonville mountain bikers, and a proposed bicycle route out to and around Lake Jacksonville bring people into town, draw cyclists who spend money at restaurants and other businesses, and give a place for healthy living. The non-profit Trails for Illinois research was on larger trails in northern Illinois, but their results imply benefits for smaller trails. Lance Brooks from the Jacksonville mountain bikers said cyclists from Petersburg and elsewhere in the region have been coming in to Jacksonville to use the Audubon Woods trails. Creating paths and routes for bicycling, running, walking, roller blading and other uses would bring people into town. And, local recreational opportunities would reduce trips to Springfield, Chatham and other trail locations by Jacksonvillians – keeping their money in the local economy. From Trails for Illinois Making Trails Count in Illinois report . . .
Read the report for more details. Watch YouTube presentation. Support efforts of TownBrook.com (Facebook, Twitter). Lori Large Oldenettel, Jacksonville Alderman Ward 2 and chair of the city’s Town Brook Special Studies Committee, and Steve Warmowski of TownBrook.com gave speeches Thursday March 28th to the Jacksonville Kiwanis Club and Friday March 29th to the Jacksonville Noon Rotary Club at their weekly meetings at Hamilton’s. We gave an overview of the Town Brook project, history and future goals, and plugged the Town Brook April 20th Spring Cleanup. At both meetings a question came up that needs to be addressed — how much is this going to cost? Short term – Phase 3 of the engineering study from Farnsworth Group will cost about $48,000. Lori has promised her fellow city council members not to ask for the funds until she gets half of that in grants and donations. So far we’re a finalist for a Make A Difference Day Foundation grant for $10,000 – and we’ll find out the third week of April if the Town Brook project is a winner. And, next week we’ll find out if we’re in the running for in the State Farm Neighborhood Assist online contest. Lori registered the project with State Farm for a $25,000 grant. On April 4th we’ll find out if the Town Brook is selected as one of 200 projects nation-wide for the final stage of the contest. There will be a Facebook voting campaign with the top 40 vote-getters receiving grants. The city previously won a $10,000 Readers Digest grant, so this is doable! The engineers at Farnsworth Group are also optimistic that the Town Brook will be recognized as an especially unique project, and can pull in grants. 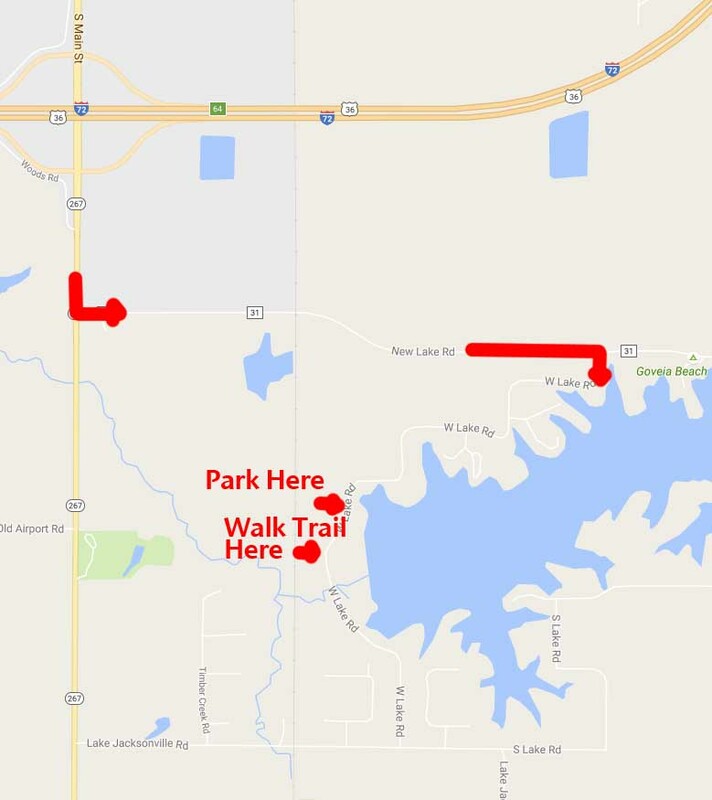 A recreational path along the creek will provide east-west connectivity for the town, and would be a great project for transportation grants as well as recreational grants. And, if you’ve ever tried to walk or ride your bike along Morton Avenue, with its helter skelter sidewalks and business pull-in traffic, you know pedestrians need a safe way to get to destinations in this major business district. But, getting back to the question of cost — there’s actually two ways to look at this. How much does will it cost to do this, and how much will it cost to not do this. Jacksonville has commissioned studies about the community, and Terry Denison at the Jacksonville Regional Economic Development Corporation said the results find our community does a great job offering amenities to seniors, but we fall short in offering things to do for youth and especially young families. Right now people go to Springfield and other places to have fun. Unless we invest in our community and start building more places for these young families to have fun here, we’re going to lose them. And we’re going to have a harder time attracting businesses, employers and new people to town. The Town Brook project means . . .
. . . all these things highlight some of the best features of Jacksonville, encourage people to get out and be active and healthy, give families a safe place to have fun with their children, boost quality of life and encourage economic development, improve neighborhoods, and boost values of adjoining properties. The Town Brook project has great potential to boost Jacksonville. This is an investment in our infrastructure — physical and social. Please get involved. Be sure to like us on Facebook, and go there and message us if you’re not already on our monthly email newsletter list.